Editor's note: There is a map associated with this press release. 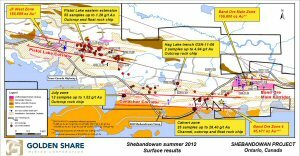 Golden Share Mining Corporation ("Golden Share" or the "Company")(TSX VENTURE:GSH) is pleased to provide the results of its Shebandowan project 2012 summer work program in Northwestern Ontario, Canada. This recent surface work program focused on the recently recognized major alteration zones of the Pistol Lake - Band Ore trend ("PLBO") with the objective to open up the mineralization on strike with the known resource areas. Four sectors yielded positive results (Please see the attached figure or visit http://www.goldenshare.ca). A total of 13 samples were collected on the newly discovered July zone located at the western end of the Conacher corridor, 3.9 km to the west of Band Ore's Zone No 4. Several shear zones, up to 8 m in width, were identified in a 120 m wide package of strongly deformed and altered felsic to mafic volcanics. The rocks display carbonate, hematite and sericite alteration and 5 samples yielded results above 0.15 g/t Au with a maximum value of 1.52 g/t Au. The Calvert zone is located 1 km to the southwest of Band Ore's Zone No 4 within the Shebandowan intrusive complex. A total of 2 angular surface float samples yielding results of up to 26.40 g/t Au prompted the re-opening of an ancient trench. A sigmoidal quartz vein hosted in the sheared and locally silicified intrusive was exposed over widths up to 50 cm. Channel samples (20 samples) within the vein and its immediate wall rock yielded steady anomalous gold values peaking at 1.06 g/t Au over 1.40 m while individual grab samples of the vein (3 samples) yielded results of up to 1.65 g/t Au. A total of 55 samples were collected along the Pistol Lake corridor from 0.5 to 2.5 km east of the JF West zone. A total of 5 samples yielded results above 0.15 g/t Au with a maximum value of 1.26 g/t Au. The mineralization is hosted in two different rock types, carbonatized mafic volcanics and a bleached feldspar porphyry. In both cases the rock sequence hosts stockworks of up to 10% quartz veinlets and locally up to 5% pyrite. Detailed resampling of this trench yielded results of 2.79 and 4.94 g/t Au in 2 samples associated with a cross structure in sheared mafic volcanics. This specific sampling was aimed at verifying the importance of low angle "Riedel" type structures in the control of the mineralization as this phenomenon could have regional implications on the localization of higher grade zones along the known mineralized corridors. Each of these four individual discoveries have their particular significance and greatly contribute in opening up new areas as well as defining styles of mineralization while refining existing working models. A follow-up work program has been initiated in early September and additional further details will be provided on these new targets. Pistol Lake Corridor : 3 km gold trend with an immediate 200 m extension of the JF West resource area to the east. Band Ore Main Corridor : 1.5 km gold trend confirmed with a new model of several sub parallel zones with recent 2012 drill intercepts of up to 18.27 g/t Au over 2.70 m.
Conacher Corridor : 4 km gold trend on strike with Band Ore Zone No 4. These developments greatly enhance the project and strengthen the potential for the delineation of a commercial gold deposit on the PLBO. Current data shows an inferred resource of 150,699 oz Au** on Pistol Lake's JF West zone (PLBO west end) and historical resources of 251,271 oz Au*** at Band Ore (PLBO east end). 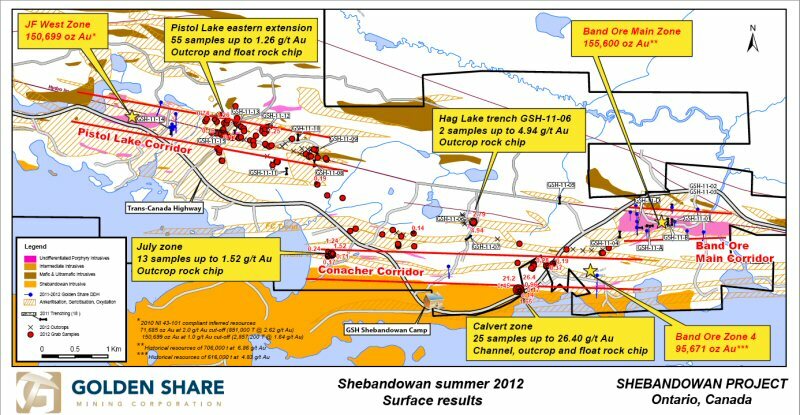 The SGP is located 90 km west of Thunder Bay, north-western Ontario, in the Rainy River - Atikokan - Shebandowan emerging gold province where Osisko Mining Corporation is currently developing the 10.52 M oz Au Hammond Reef gold deposit 100 km to the West of the Company's project. The SGP is serviced by a railroad line, a high tension power line and the Trans-Canada highway all providing excellent infrastructure to the project. Lake Shore Gold Corp., a Canadian emerging gold producer, holds a strategic 27.2%* interest in Golden Share which is led by a technically focused management team strengthened by an experienced board of directors and a proven advisory board including successful geologists Roy Corrans and Sethu Raman as well as seasoned financier Anthony Frizelle.